One thing we love about summer is tomatoes. Fresh garden tomatoes full of flavor. We eat them many ways and at many meals during the summer. We savor the short time that garden tomatoes are available. Come fall and winter, we avoid fresh tomatoes with the exception of the little grape or cherry ones that although they don't taste of sunshine and summer at least they do have some flavor. It's not summer on a plate but they are flavorful . 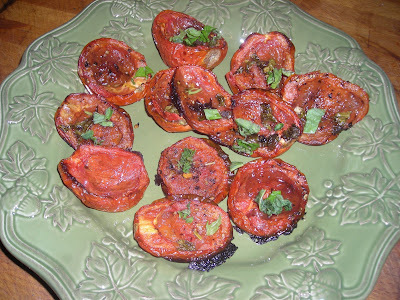 . . store bought plum tomatoes roasted with olive oil, balsamic vinegar, salt, pepper and fresh basil. The intense tomato flavor that roasting brings out turns these ho hum tomatoes into flavorful tomatoes. The recipe comes from Ina Garten. Seems to be an Ina week at Linderhof! From her new cookbook, Barefoot Contessa, Back to Basics. We ate them as she suggested, in a caprese salad. 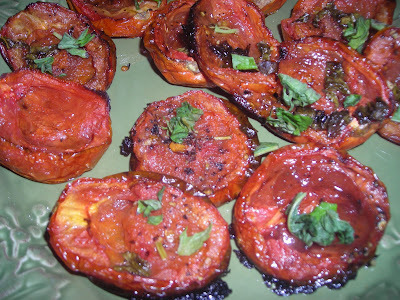 Arrange tomatoes, cut side up, on a sheet pan in a single layer. Drizzle with the olive oil and balsamic vinegar. Sprinkle the garlic and sugar and salt and pepper to taste. Roast for 2 hours until the tomatoes are concentrated and begin to carmelize. Those look really good! I'm lucky to be still getting a few home grown ones here. Cold snap coming soon though..
Martha, those look so good!